Tumors of the Central Nervous System (CNS), which includes the brain and spine, can be benign or malignant (cancerous). Benign CNS tumors are more common, with more than 500,000 people in the U.S. living with a non-cancerous tumor and about 140,000 with a malignant tumor. Most malignant tumors are metastatic, having spread from cancers primarily located in other organs. Malignant brain tumors are inherently serious and life-threatening — they are invasive and destroy brain tissue, as well as create pressure on brain because of the limited space within the skull. Not all brain tumors cause symptoms. The most common symptoms that occur could be the result of increased intracranial pressure (headache, vomiting), or damage to/irritation of nerve tissue (loss of neurological functions, seizures). Diagnosis is based on clinical evaluation and imaging. Surgery: complete or partial resection of the tumor. to remove as much as possible. Radiotherapy: the most commonly used nonsurgical treatment for brain tumors. Chemotherapy: seldom used to treat brain tumors, as the blood-brain barrier prevents the drugs from reaching the cancerous cells. Focused ultrasound has tremendous potential to improve the treatment of certain brain tumors. As this modality is non-invasive and accurate, it may be able to thermally ablate only targeted tissue while sparing healthy adjacent brain tissue. This is especially critical in the brain where any damage to healthy tissue can result in significant loss of function. In addition, focused ultrasound has the potential to reduce the risk for infection and bleeding, lower procedural morbidity by avoiding the need to open the skull, and avoid the toxicity of radiation. Currently, focused ultrasound can effectively target small tumors located in the center of the brain, in areas such as the medial part of the thalamus. The Foundation is conducting and funding technical research to expand the area of the brain that can be reached and treated by focused ultrasound in collaboration with academia and industry. For the first time in March 2014, clinicians at the FUS Center of University Children's Hospital Zurich used focused ultrasound to successfully ablate a portion of a recurrent glioma, a procedure that established the feasibility and safety of the treatment. Additional clinical trials to prove safety and efficacy are required to translate this milestone into an available treatment. Read the report. In addition to the ongoing clinical research to evaluate the use of Focused Ultrasound for thermal ablation of brain tumors, several other Focused Ultrasound brain tumor treatment approaches are being investigated. Researchers at UVa in collaboration with the Foundation and InSightec are conducting a pre-clinical study to evaluate the safety and efficacy of a low frequency system, (220 kHz), as a tool for noninvasive MR guided trans-cranial thermal ablation of tumors in the brain. The advantages of using a lower frequency compared to the currently active clinical system include the potential to reach much more of the brain and treat larger volume in less time. 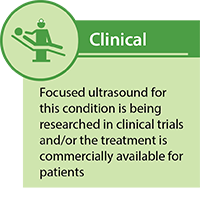 A third treatment application is non-thermal destruction of tissue with Focused Ultrasound which is being evaluated by several sites. In this method the acoustic energy is used to create non-thermal mechanical effects at the focal point which can damage and destroy tissue. Recently investigators at Brigham and Women’s Hospital were able to create non-thermal brain lesions using focused ultrasound in combination with micro-bubbles. For a full list of known brain tumor clinical trials, please see here. Purpose: Investigating transcranial treatment using focused ultrasound of patients with recurrent brain tumors (new glioma, recurrent glioma or metatstatic brain tumors) for whom conventional surgery is not an option. Focused ultrasound is not approved by any regulatory bodies worldwide as a treatment for brain tumors, nor is it reimbursed by medical insurance providers for such. Kovacs Z, Werner B, Rassi A, Sass JO, Martin-Fiori E, Bernasconi M. Prolonged survival upon ultrasound-enhanced doxorubicin delivery in two syngenic glioblastoma mouse models. J Control Release. 2014 May 27. pii: S0168-3659(14)00336-8. doi: 10.1016/j.jconrel.2014.05.033.